I've been a fan of Outside Magazine's podcasts since they launched early in 2016 but a recent episode left me immensely grateful for something I don't think much about: sports bras. In "How the Sports Bra Changed History," Outside's contributing editor, Florence Williams, explores the history of the sports bra. She interviews Lisa Lindahl, a woman in Vermont who, along with friends Polly Smith and Hinda Miller, invented the sports bra. They started running in the "jogging boom" of the 1970s, and although they loved the way running made them feel, they hated how uncomfortable their breasts were, bouncing around. "Why isn't there a 'jock strap' for women?" Lisa remembered wondering. "I got to thinking, what would that bra have to do? So I sat down at my dining room table and wrote down a list. The straps couldn't fall off. They should be wide enough that they don't dig in. Ideally I was hoping it could be modest enough that I could take off my t-shirt on really hot summer days, because I had a running partner who would do that, he would take off in the middle of a run, take off his shirt, and tuck it into the back of his shorts, and I was SO jealous, because I couldn't do that!" "Why isn't there a 'jock strap' for women?" 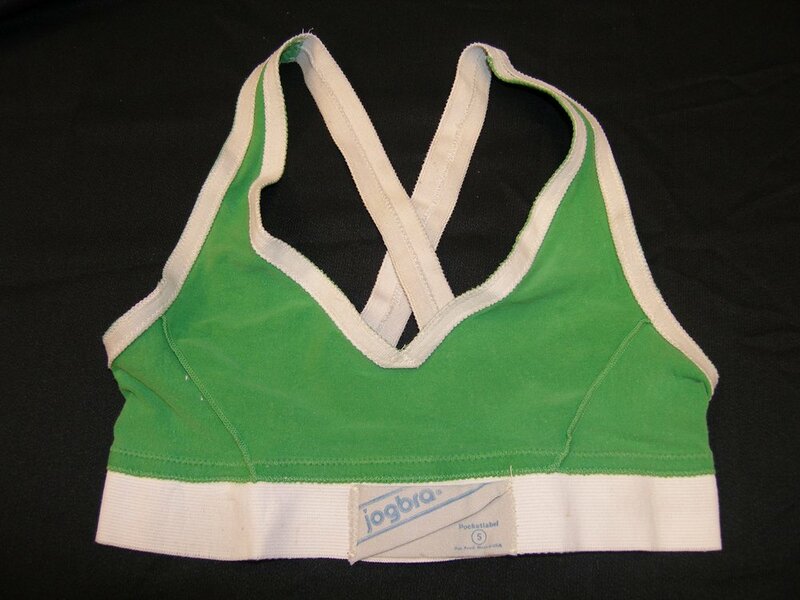 I was born in 1977 -- the same birth year as the sports bra -- so I have had the good fortune to be a female runner in an era that never lacked for these critical support garments. But even in my own lifetime, I've seen amazing improvements. The white cotton sports bras I remember wearing as a member of the Lesher Junior High track team had narrow straps that dug into my shoulders and they chafed around the middle - and they were made of cotton so they were soaking wet most of the time. The wide-strapped, breathable Lululemon bras I wear now are so much more comfortable - not to mention more stylish! Thank you, Lisa Lindahl, Polly Smith and Hinda Miller. Our shirts are off to you!